As part of its settlement with federal and state officials over its diesel cheating scheme, Volkswagen has agreed to invest $800 million in clean transportation technologies in the state of California over ten years. The money will be dispersed by Electrify America, a subsidiary created by Volkswagen specifically to coordinate how the terms of that settlement get implemented. Electrify America has already begun work on the first $200 million worth of projects. The second round of funding just approved by CARB will see $115 million will go to build chargers in metropolitan areas, another $30 million will be used to install charging stations along major highways, and $12 million will be devoted to installing chargers in the parking garages for apartment building and and condo complexes. In addition, some of the money will fund educational programs designed to educate consumers about electric cars and create charging stations for zero emission bus fleets, ride hailing services, and autonomous vehicle charging technologies. The plan has met with criticism from some EV charging companies like ChargePoint and Evgo, which feel it freezes them out of certain marketing opportunities in California. They objected vigorously to the Electrify America plan but their objections did not find favor with the board. In a recent story about new ultra fast charging technology in Germany, I facetiously suggested there are currently only 2 such fast chargers in the world. That got the attention of Mike Moran, a communications specialist with Electrify America. Rather than telling me I was an idiot, he politely pointed out his company has two 350 kW fast charging stations in operation at the San Francisco Premium Outlets. 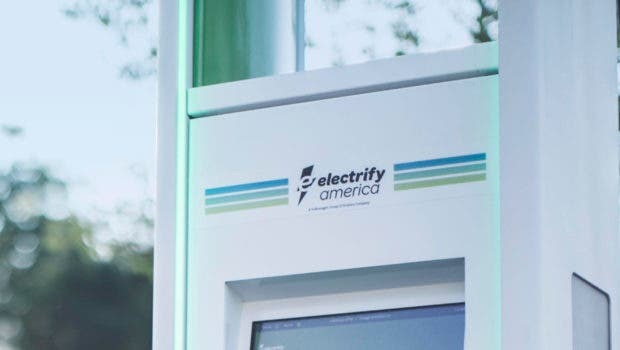 A map of existing and proposed Electrify America charging locations can be found on its website at the following link: Electrify America charger map. (Happy to see one of the future locations is just a few miles from my new winter home in Fort Pierce, Florida.) The company’s high power chargers feature liquid cooled charging cables — an industry first. Demystification is good, especially at a time when the fossil fuel PR machine is cranking up a whirlwind of stories touting the glories of driving big, thirsty road locomotives as if that is a right guaranteed by the Constitution, opposing EV incentives, and just generally running down anything and everything that might actually reduce carbon emissions (and profits) from burning fossil fuels. The Volkswagen diesel cheating scandal was a huge embarrassment to the company and cost it tens of billions of dollars in fines and lost profits. But if that’s what it took to blast one of the largest car companies in history out of its business as usual reverie and to transition away from gasoline and diesel cars, it was a worth it. Because of it, VW may wind up being one of the leaders of the electric transportation revolution while several of its peers fall by the wayside. A nationwide system of Level 2 and Level 3 chargers in America’s cities and along its highways may be just what’s needed to tip the balance in favor of EVs.